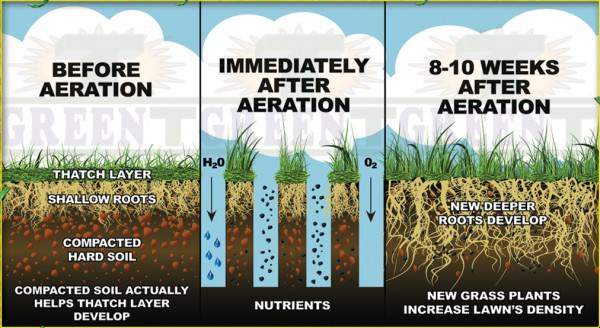 What is aeration and why do you need it? Home / What is aeration and why do you need it? Proper mowing, fertilizing, and watering are essential to achieve and maintain a beautiful lawn, however, it is also important to ensure that nutrients can reach the soil beneath your grass. Aeration and overseeding are vital to this process, as well as repairing the wear and tear that summer inflicted on your lawn. August through mid-October is the perfect time to seed a new lawn or overseed an existing one. The combination of warm days and cool nights with adequate moisture in the ground creates the ideal growing conditions for grass seed. Improves turf health. One of the best benefits of lawn aeration is that it can improve the overall health of your grass. Core aeration works to provide the roots with greater access to air, water, and fertilizer. This access improves the health of the turf, resulting in deeper and more extensive turfgrass roots. Reduces thatch build-up. If thatch (the layer of dead grass that accumulates on your lawn) builds up to a thick layer, it can rob your grass of necessary rain and nutrients. Core aeration helps manage that build-up by introducing thatch-decomposing microorganisms from the soil to the top of the thatch layer. Relieves soil compaction. Compacted soil can prevent air, water, and fertilizer from reaching your lawn’s root system, causing dead spots, patches and/or thinning. By removing cores in the aeration process, soil density is decreased, thus relieving compaction. Reduces water runoff and puddling. If you find your yard has runoff or puddling problems after a rain, aeration could be the fix you need. By reducing soil compaction, your lawn will be able to absorb more rainwater. Prepares grass for winter dormancy and a green spring. Planning for aeration and seeding now gives cool-season grasses enough time to protect the grass from summer drought stress before the first winter frost arrives. Click to schedule your aeration and seeding service now for a lawn you can love and enjoy next spring! Have a landscaping issue you just can’t solve? Need help planning your outdoor space? We’re here for you. Contact our experts today! Get Gardening, It’s International Plant Appreciation Day! We are a member of NALP (National Association of Landscape Professionals), SIMA (Snow and Ice Management Association), and LCA (Landscape Contractors Association). Staff members are certified by Techo Block, ICPI (Interlocking Concrete Paving Institute), and NCMA (National Concrete Masonry Association) in segmental retaining wall installation. © Absolute Landscape & Turf Services, Inc.